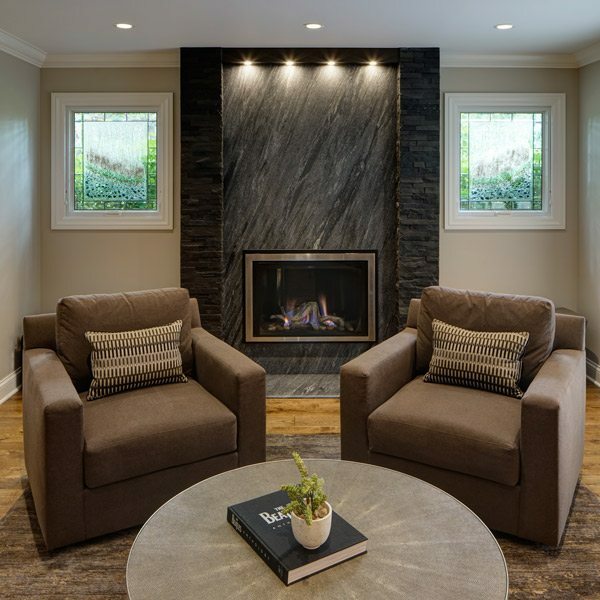 For this Oak Brook remodeling project, the first step was modernizing the existing first-floor layout and removing many of the interior walls to open up the main living areas on the first floor. These changes paved the way to expand the kitchen and integrate the dining room and family room into a larger first-floor living area. In total, over ten total rooms were part of this home renovation. Since the kitchen was created to be the hub for entertainment space, a large multi-purpose island was designed to serve as a grand workspace and a casual seating area. Quartzite was used for the perimeter countertops and the dramatic range wall backsplash in combination with multi-colored marble tile to give the kitchen a modern glow. Double ovens were placed side by side and elevated to increase out of the way accessibility. A full compliment of Sub-Zero and Wolf appliances completed this high-end kitchen remodel offering state of the art technology and convenience. Contrasting light and dark colors and different textures help create a compelling transitional design that offers visual delights in every room. Included in the mix are medium stained, wide plank hardwood floors, dark stained and white painted transitional cabinets, and light quartzite natural stone countertops. This kitchen is part of a whole home remodel, also see: Transitional Oak Brook Dining Room Renovation, and Transitional Oak Brook Basement Bar Renovation.